Cosmetic Stem Cells in Park City, Utah. At Docere Medical, we take skin rejuvenation very seriously and offer our patients several different options for creating youthful, healthy, glowing skin using the power of regenerative medicine. At Docere Medical, we take skin rejuvenation very seriously and offer our patients several different options for creating youthful, healthy, glowing skin using the power of regenerative medicine. Skin aging takes place on a cellular level so it makes sense to fight those changes at the same level – that’s where regenerative therapies like Platelet Rich Plasma (PRP), Adipose Derived Stem Cells (ADSC’s), and exosomes come in to play. Platelet rich plasma (PRP) uses growth factors in your own blood to signal your skin’s stem cells. PRP is made after collecting a small amount of blood from the patient and then spinning it down to isolate the potent growth factors found within the platelets. All of our cosmetic regenerative therapies at Docere Medicine use PRP. Adipose Derived Stem Cells (ADSC’s), obtained from the patient’s own fat by a mini-liposuction procedure, can be added to the PRP to further enhance skin rejuvenation. Adipose Derived Stem Cells are rich in Mesenchymal Stem Cells, which have the ability to bring about diverse regenerative changes in the skin. 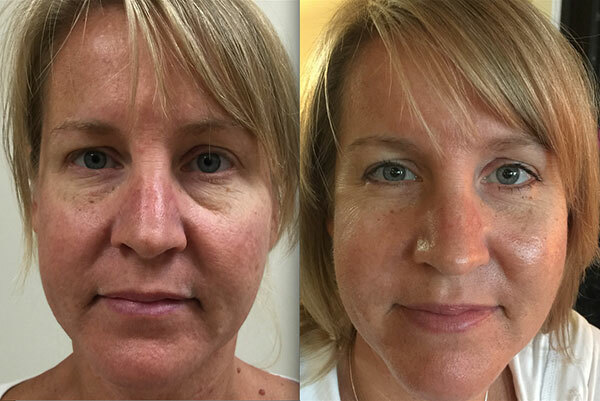 Before and six months after stem cell injection to the face performed at Docere Medical. Notice how the ‘after’ photo shows far greater uniformity of color. Of particular note is the correction of the dark circles around the eyes, believed to be from strengthening of blood vessels, preventing micro-vascular, sub-dermal ‘leaking’ of blood into surrounding tissues. Our skin rejuvenation procedures are done in our office with topical numbing cream given prior to the procedure. For more information about harnessing the healing power of your own cells for skin rejuvenation, please contact us today!